Finely acicular, very hard and brittle structure. It is formed during quenching of austenite at such high cooling rates that the carbon does not have time for diffusion from the lattice. During heating (tempering) at high temperatures (up to 720°C) and with extended annealing times (up to 10h), martensite will eventually transfer to ferrite with embedded nodular cementite. Whereas the transformation into the pearlite stage as well as the intermediate stage require diffusion processes, the martensite is formed by diffusion-free shearing of the kfz lattice into the krz lattice according to natural laws (see Body-centered). The martensite plates are formed at a very high speed at a time. Each martensite plate is formed immediately in its full size and the further transformation ocurrs by formation of new plates. 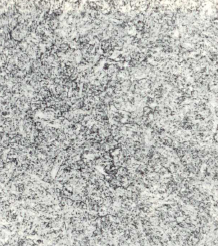 The size of the individual plates is determined by obstacles such as grain boundaries, slag inclusions, and existing martensite plates. 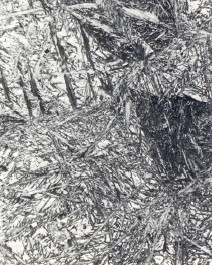 If the Ms temperature is not reached, the plates are formed in groups (s. Martensite point). If the temperature does not continue to drop after a certain undercooling, the transformation will stop as the stresses occurring during shearing of the lattice prevent further transformation, Only a decrease in temperature will create the requirements for further shearing. The carbon leads to a tetragonal expansion of the γ iron lattice which increases as the carbon content rises. Being a diffusion-free process the martensite formation always starts when the temperature falls below Ms and cannot be undercooled by further increasing the cooling rate. The martensite formation is conitued below Ms. However, it is never fully completed at any temperature. A proportion of the residual austenite that increases with the carbon content always remains. 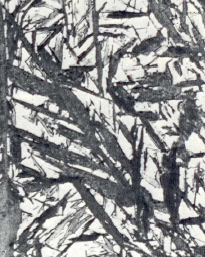 Martensitic matrix has high hardness and tensile strength but virtually no elongation at failure.